This Pure Country daughter was our sale topper as a bred heifer in our 2015 Salebration with ½ interest selling to Hoffman Ranch in Thedford, NE. A daughter of KJ 750P Pure Progress 989W (now a donor for JM Cattle Co) she represents some of the best genetics in the breed with Jensen, Holden, Sandhills, & Hoffman listed in her pedigree. Her beautiful profile has earned her the name of “pretty cow” at Cottage Farm Genetics where she has produced some excellent flushes. 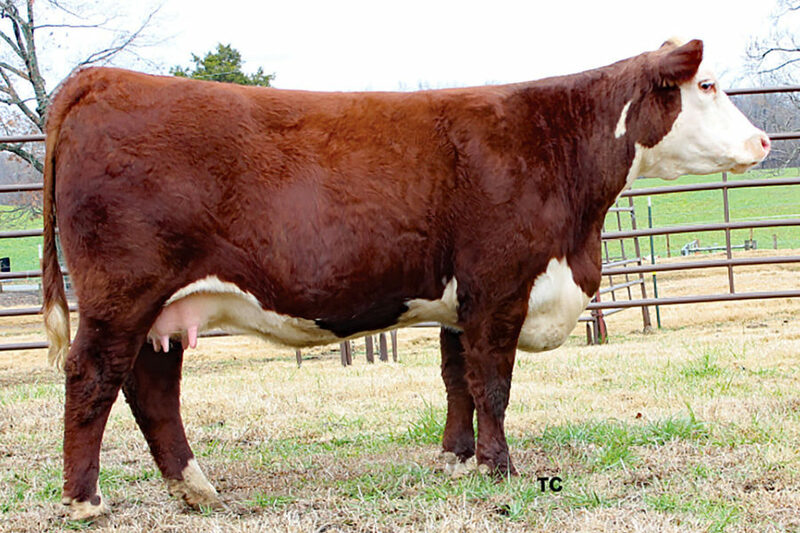 Rights to flush sold to Schutte & Sons Polled Herefords in Guide Rock, NE in the Salebration. Recent flushes to NJW 135U 10Y Hometown 27A, H WR Sustainable 5511 ET and KCF Homeward. Owned with Hoffman Ranch, NE.